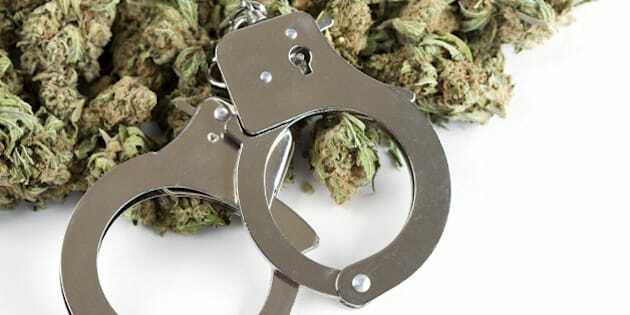 Marijuana and handcuffs conceptual image for criminal aspects of the drug. Americas Quarterly, a journal of "politics, business and culture in our hemisphere," recently posed an open question: "What would you tell the next U.S. president about Latin America?" Responses from a diverse group, including a president, indigenous leaders, an ambassador, CEOs, NGO directors, were published in the journal's August "Memos to the Next President" issue. Colombian President Juan Manuel Santos seized the opportunity to write about "an important matter for both of our nations and many other countries around the planet: the global drug problem" and express his "absolute conviction that the moment has arrived for the world to adopt a new approach in its drug control policies." I fully applaud the president's forward thinking and could not agree more. He writes, "Plainly put, the so-called War on Drugs launched by President (Richard) Nixon in 1971 has not been won. Perhaps it is time to recognize, as the U.S. surgeon general has said, that this war on drugs has become a war on people who use drugs." Santos calls for "an honest reckoning of what is happening and ... greater coherence in looking at this issue." At the UN's April General Assembly Special Session on the World Drug Problem (UNGASS 2016) -- held this year largely due to the efforts of Colombia and other Latin American nations' leaders -- a vast majority of nations expressed conviction that a new approach is indeed needed, and now. During the ensuing roundtable discussions, it quickly became apparent that change is already underway. What President Santos writes in his letter to the next president, and many other leaders expressed at UNGASS and since, is about redirecting the global approach to drugs from prohibition and criminalization, which has proven to push money and power into black-market hands, into funding drug use prevention education and public health programs to assist problem drug users rather than drug interdiction and crop eradication efforts. Colombia has endured immeasurable loss due to this failed "war" and has the "moral authority," as Santos writes, as well as the compassion and empathy, to lead this change. In fact, it is already doing so within its own borders, and other nations are taking note. Last December, Colombia implemented the kind of improved control policy Santos suggests with a new licensing structure for cultivation, manufacturing, research and export of cannabis derivatives for medical and scientific purposes. Santos explained, when announcing the new licensing regime, that it will allow Colombians improved, safe access to the valuable medicinal qualities of cannabis and increase research opportunities in the nation. The regulation also authorizes export of Colombia-produced natural, standardized, medicinal-grade cannabis oil extracts, which will be grown and processed in the nation's environmentally friendly and socially conscious conditions. A key requirement in providing effective public health programs is the identification of developing drug problems and early intervention. As legal production of cannabis quickly replaces the cultivation piece of the black market's pie, the world must consider how best to wrest distribution from these dark hands, as well. I would argue that, for many reasons, pharmacies are the ideal cannabis distributors, as has been implemented or proposed in many U.S. states, Canada, Germany, Israel and other places. We must recognize that, as President Santos wrote, "as long as there is demand, merchants of all types will step in to provide the supply." If we as a society are to succeed in extinguishing the cannabis black market and meeting public health needs, we must allow established large channel distributors, that can be held accountable by regulators for the safety of both products and consumers, to become the cannabis "merchants." Why pharmacies? As the world's main providers of medicine, pharmacies have a long history of providing safe, accountable transportation logistics, storage and distribution of drugs, including narcotics. And pharmacists -- who in many parts of the world, and increasingly in Canada and the U.S., are frontline healthcare providers -- provide valuable education and counseling about medicines based on their extensive training and knowledge of drugs' properties and interactions as well as usefulness in treating various illnesses and disorders. A key requirement in providing effective public health programs is the identification of developing drug problems and early intervention. But under the current climate of prohibition, coming forward to seek help is a dangerous proposition that can lead to criminal consequences so even drug abusers who want assistance instead choose to remain hidden, without access to the kinds of programs and personal support needed to overcome their problems. The war on drugs has thus contributed to the picture of drug abuse we now see all too often: Addicts hiding in back allies and dark basements, unable to step into the light to ask for help. The personal relationships built between pharmacists and their customers provide a window of opportunity that enables them to see, early on, who needs help with a developing drug problem, and to offer education, counseling, referral and support. When cannabis is made available through controlled channels of distribution, with the support of existing regimes that understand how to regulate dosage levels and intervene when needed, we can evolve beyond the black market and develop better opportunities to provide education and intervention. As with any change, our language must evolve to describe current, rather than past, attitudes and practices. The "war on drugs" is over, and it's time we stop using that phrase to describe the international approach to drugs. The title of UNGASS 2016 referred to "the world drug problem." Perhaps UNGASS 2019 will reflect in its title the world's new, more effective "humane approaches to drug use and public health." President Santos concluded his letter with an admonition: "We can do better." Yes, we can. In fact, we already are.